Tuesday, 20 November 2018, 6.00 pm in the Gallery, Southern Cross, Abel Smith Street, Wellington. 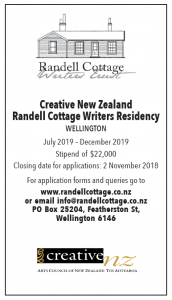 Please RSVP to info@randellcottage.co.nz or call Robyn on 04 4764823 evenings by 15 November. Receive and consider the following recommendation from the Committee of the annual subscriptions for the year (2018/19): that subscriptions for 2018/19 remain at $15.00 for seniors/students, $30.00 for individuals and families and $60.00 for businesses as set at the 2016 AGM. Tim Gruar and Leslie Brown have expressed willingness to be nominated as ordinary members of the Committee. There is room for the nomination of at least one ordinary member to the committee. to serve should be emailed to the Secretary at info@randellcottage.co.nz in advance of the meeting. The business part of the meeting will be followed by a speaker. Details to come.